During the recent CSM summit Aryth, one of the representatives from the Imperium, brokered a deal to buy a Keepstar citadel in the system of 68FT-6. Let me bring that system up on the DOTLAN map. 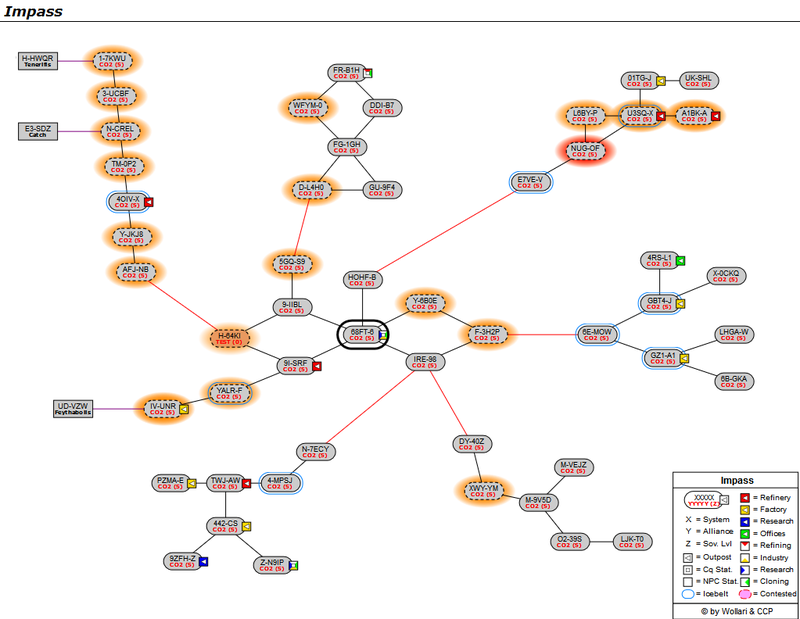 Yes, that is in Impass, and the system 68FT-6 is the capital system for the Circle of Two alliance. In one of those great moments that happen from time to time in null sec politics, CSM member The Judge, who appeared on the Imperium ballot despite being in CO2, finally got fed up with the way GigX, the leader of CO2 was running the alliance and sold him out. Things have not gone well for GigX and CO2 since they betrayed the Imperium a year and a half back at the battle of M-OEE8 during the Casino war. His immediate gains in territory were stripped from him once his erstwhile allies had sent us packing to Delve and he too had to head south to form up with TEST. After acquiring space in the south things began to slowly deteriorate, both within the alliance and with neighbors, until things finally broke down with TEST, their closest ally, in late August. Then war opened, with only a few siding with CO2. And now this. 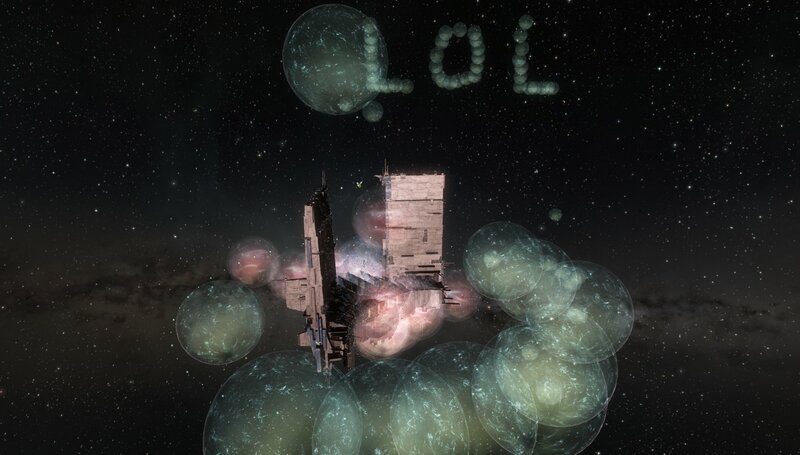 The Imperium holds their Keepstar and has a hellcamp setup to try to catch and blow up anybody trying to escape. There is a temp blue situation with TEST so we can work with them on this. Meanwhile, TEST now controls all of the CO2 Fortizars, The Judge emptied the alliance coffers, and the line members have to be in a panic or looking for an out. TEST has said they would accept corps and individuals from CO2. This is going to take some time to play out, but I felt I had to put a pin in the date to remember when it started. This could be the end for CO2. It certainly seems likely to be the end for GigX, who was alleged to have threatened The Judge with an out of game visit and has reportedly been perma-banned for this. The Nosy Gamer – Did The Judge Really Pull Off The Biggest Heist In EVE Online History? And so it goes. I was going to write something up about today’s patch, but aside from new skills coming in for the moon mining update set for the upcoming Life Blood expansion, there isn’t much to talk about. But now we have this instead! This entry was posted in entertainment, EVE Online, Null Sec and tagged 68FT-6, Casino War, Circle of Traitors, Circle of Two, Imperium, Judgement Day on September 12, 2017 by Wilhelm Arcturus. Our RMT empire expands! CCP has picked us as the winner again! Not exactly how I imagined CO2 would die via Imperium action, but also somewhat fitting given the history of both sides. @SynCaine – There is a certain “betrayer betrayed” symmetry in the whole thing. I expect the fact that Aryth and The Judge made their deal at a CSM dinner in the presence of CCP employees, who then didn’t interfere with the game by turning around to warn GigX, will be seen as CCP picking winners by at least one person. > There is a certain “betrayer betrayed” symmetry in the whole thing. Because sometimes what you really need is for someone else to pay a horrible price. @Klyith – It is a video game, so I am not sure “horrible price” enters into it. Heh, it’s a rick and morty bit. I suppose that could be taken the wrong way in light of the gigx threats. But CO2 did just get handed a pretty horrible price …in game… for the casino war betrayal. @Klyith – I’m disappointed I didn’t get that reference. My daughter just made me binge watch all of Rick & Morty last week, so I’d like to think I am up on that. Most alliances have little uniqueness, therefore purpose to exist. Players are in them for convenience and will jump ship when inconvenient. I doubt CO2 had ever any reason to be. GSF was a rare exception with identity and goals. Too bad that this identity didn’t include the ability to PvP, so were slaughtered and evicted. @Gevlon – Yup, it is such a pity that Goons were eradicated after the Casino War. I’m sure the game misses them. No, I was eradicated, so all my memories are “was”. I wish I could be there and eradicate Goons but we know it’s impossible. But hey, maybe one day some big studio buys CCP (or EVE from CCP) and there will be fair chances for all. Oh wait, the day it happens The Mittani cashes out and Goons will crumble on their own. Gevlon, scammed out of freaking TEST, talking about alliance culture and how that works is about as accurate as Gevlon, player of 700+ PUBG games with zero point zero wins, talking about what is a winning strategy.